If you have an existing SMSF portfolio or just starting out in SMSF (Self Managed Super Fund), investing in property with your SMSF might give you the edge you need to diversify your SMSF strategy. Redwood Advisory works closely with our clients to secure the right type of property investment loan for their SMSF. Note, we donot recommend property within an SMSF. You might be asking yourself if a smsf loan is right for me. And good thing you did. Managing your own smsf property investments shouldn’t be taken lightly. At Redwood – our specialist SMSF Advisors led by our Founder, Ivan Filipovic, can guide you in setting up your SMSF and the structure required to purchase property or bare trust. We will ensure you have someone to turn to ensuring you donot make the common mistakes with investing in SMSF property. Many of our young customers come to us with a relatively low amount, normally high 5 figures, to low 6 figures in their industry super fund. With a SMSF property you use the capital established in the fund and borrow the rest for the purchase of your first SMSF property. An SMSF property is a great way to invest and has proven to be a solid investment for many years. At Redwood we are passionate about creating wealth through SMSF property investment. Our experienced property strategists will develop a plan to build wealth by investing in property just for you. Why choose Redwood when investing in Property? How Does ‘self managed super funds buying property’ work? Redwood Advisory – SMSF Property Specialists make borrowing to invest easy contact us today for a free no-obligation consultation. How does ‘borrowing to invest’ work? SMSF Property Investing is not for everyone. However, with the right guidance and education, SMSF Property investing either through a third-party lender or a related party can be a great way to diversify investments and create wealth for your retirement. Remember thats why over 1 million Australian’s use SMSFs to invest their superannuation for their retirement. At Redwood, you will meet with our experienced staff to ensure you receive the education required to understand the benefits and risks of investing in property. How Does SMSF Borrowing Work? 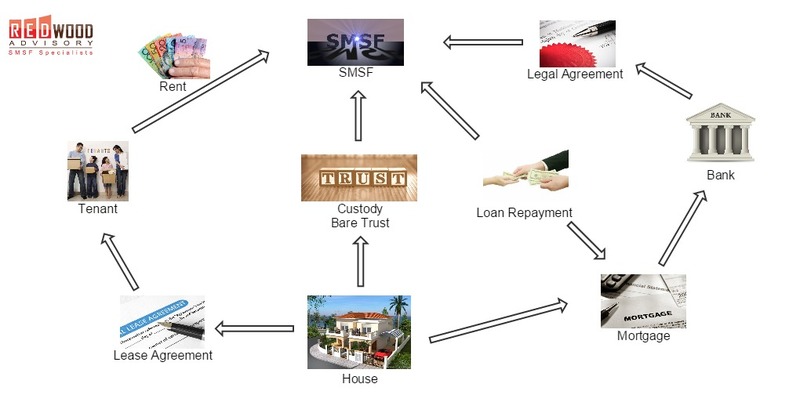 The rules and regulations for setting up and borrowing through a SMSF are complex. Redwood Advisory’s SMSF specialists can make borrowing to invest easy to understand to make sure this investment strategy is right for you. If you already have a SMSF or a new SMSF, you’ll need a SMSF Specialist Advisor to review your Trust Deed to ensure you have the necessary powers to borrow under your fund. It is important you seek appropriate advice. By doing this upfront, it will avoid the nasty surprise when the Bank’s lawyers send a bills upon settlement of the property. The first step to purchasing an SMSF investment property through your SMSF borrowing is by setting up a separate security trust (commonly known as ‘Bare Trust’) on behalf of your SMSF. This new security trust will buy and hold the property, and provide a guarantee for your SMSF loan. The bank won’t be able to access your other SMSF assets. Note – most if not all SMSF lenders will require a personal guarantee when obtaining a SMSF Loan. A common error made by SMSF Trustees is paying for the deposit on the SMSF Property from personal funds. The deposit for the SMSF Property must be paid from your SMSF balance, and a SMSF Property loan is obtained to cover the difference. Superannuation contributions can be used to service the loan as well as salary sacrificed contributions. There are a number of lenders providing competitive rates on SMSF Property loans, generally offering 80% LVR for residential property and 70% for commercial property. Recently, investment lending overall including SMSF Loans have been subject to scrutiny and change, be sure to consult Redwood for a loan assessment prior to proceeding with your SMSF Property purchase. By completing Redwood SMSF Loan Assessment, you will have the piece of mind to know how much you can borrow and the likely interest rate and product terms.